National Home Security Month taking place throughout October, there’s no better time to think about the safety of our homes. Crime is on the rise and the nights are rapidly lengthening. But are we keeping our homes secure enough? With National Home Security Month taking place throughout October, there’s no better time to think about the safety of our homes. This awareness-raising month was set up to battle break-ins across the UK and encourage year-round protection — however, October and November in particular are grim months for home security. According to the National Home Security Month website, burglaries and domestic damage increase by a shocking 160% during the Halloween period, with Bonfire Night being statistically the worst night of the year**. As for the rest of the time, the results aren’t much better. Compared with the previous year, the number of police-recorded burglary offences increased by 6% in the year ending March 2018***. So, if you haven’t already, it’d be a wise move to up your game when it comes to home security. Leading high street retailer Robert Dyas has a plethora of home security and smart home essentials, from security lights to safes and state-of-the-art alarms and CCTV systems. One of the weakest points of a house, and the part which is usually used to force entry*, is your French or conservatory double doors. Make this point more secure with the easy-to-fit Patlock French Patio Keyless Security Lock (£54.99, reduced to £49.99 from 4/10/18 to 31/10/18). 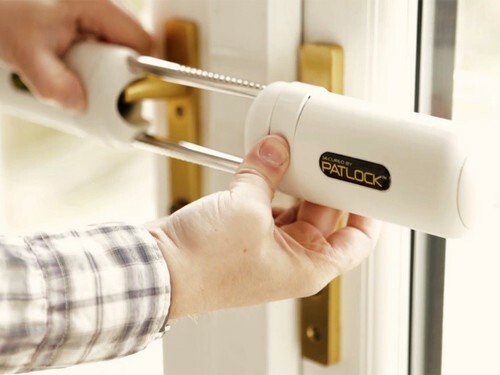 It works by holding the internal handles securely and restricting the movement of the exterior handles, as well as acting as a visual deterrent. Tall trees, bushes and large gates are a great way to give you more privacy, but while they may shield you from nosy neighbours, all the darkness and solitude could entice thieves. The Status Natural Grey PIR LED Floodlight (£19.99 - £34.99) will switch on automatically when it detects movement outside. If you want extra security, the Ring Floodlight Cam Smart Security Camera with Siren Alarm (£249) (online only) features built-in floodlights, two-way audio, a siren alarm and live video that you can access from your smartphone. It even has customisable motion zones so you can tailor the sensors to the layout of your outdoor areas. If would-be burglars have noticed your lights haven’t been on all week, your home could be more at risk of a break-in. With a TP-Link Wi-Fii Smart Plug (£24.99 from 4/10/18 to 31/10/18) you can schedule your lamps to come on at certain times, creating the appearance that someone’s at home. They’re really easy to use: instead of turning them on at the wall, you turn them on with your smartphone. If you’re worried about your bills mounting up, keep an eye on your energy usage with the TP-Link Wi-Fi Energy Monitoring Smart Device Plug (£34.99) (online only). Under mats or flowerpots and inside letterboxes are the first places thieves would look for a key, so if you really must leave a spare key outside, use the Hilka Wall-Mounted Key Storage Box (£16.99 from 4/10/18 to 31/10/18). Losing your keys isn’t just frustrating, it’s a security risk too. By attaching a Tile Mate Bluetooth Phone and Item Finder (£22.99) (online only) to your keychain, you’ll always be able to find them. It works via a smartphone app so you can either make the Tile Mate ring or see where it is on a map. You may think your home will be fine in broad daylight but a lot of burglaries are actually committed during the daytime, so it’s a wise idea to have a camera at home while you’re out. The Canary All-in-One Home Security Device (£159) (online only) has a 90+ dB siren, motion-activated recording, night vision and other high-tech features to keep your home safe. It’s also easy to set up and is available in both black and white. Plus, videos of recent events can be stored on the free cloud storage so they’re there if you need them. To install, all you need to do is plug it in and connect it to the internet — no installation or costly contracts necessary. The EZVIZ Mini O Plus 1080p Indoor Wi-Fi Camera (£79.99, reduced to £39.99 from 4/10/18 to 31/10/18) (online only; in store from 4/10/18 to 31/10/18) is a fantastic budget option. It sends motion detection alerts to your phone, has night vision and two-way audio and is super-easy to set up. It also works with Amazon Alexa and Google Assistant devices. The Ring Wi-Fi Video Doorbell 2 (£179) (online only), on the other hand, will monitor the outside of your home. With a motion-activated camera, two-way audio and 1080 HD video, you can see, hear and speak to anyone at your door in real time from your smart device or desktop, whenever someone steps onto your property or rings the doorbell. If it’s a whole-home security system you’re after, the Yale Smart Living Home Alarm Kit (£299.99) (online only) comes with a Yale Smart Hub, external siren, two Yale PIR Motion Detectors, a keypad and a Yale Door and Window Contact for comprehensive all-round security. It allows you to arm or disarm the system via your smartphone or tablet, or even part-arm the system so that you can set the alarm downstairs and continue to move freely around the rest of your house. You can even add up to 20 other devices to extend the security of your home. If you’re really strapped for cash, Robert Dyas has some great value door and window security products like the Unicom Window and Door Alarm. Quick and simple to attach, it costs only £3.99 (reduced to £1.99 from 4/10/18 to 31/10/18) and works by emitting a loud 85dB siren to alert you if a window or door is opened. Most burglaries are done on impulse, so don’t give thieves a chance to consider breaking in. Hide valuables away in a safe like the Pro-Craft Safe and Cash Box (£39.99, reduced to £29.99 from 4/10/18 to 31/10/18), and keep your laptop or other digital devices in the Yale Laptop and Media Safe (£69.99, reduced to £59.99 from 4/10/18 to 31/10/18). If your items need a padlock rather than a safe, use the Yale Protector 45mm Laminated Steel Padlock (£12.99). With an anti-cut, anti-pick design and weatherproof jacket, it’ll keep them secure indoors or out. This press release was distributed by ResponseSource Press Release Wire on behalf of Robert Dyas in the following categories: Men's Interest, Leisure & Hobbies, Home & Garden, Women's Interest & Beauty, Environment & Nature, Consumer Technology, Retail & Fashion, for more information visit https://pressreleasewire.responsesource.com/about.